Religious belief is common among China’s rural population, representing the most significant base of believers. In an effort to attack religion at its core, the Chinese Communist Party (CCP) has been mobilizing the masses to monitor and report each other using a variety of means. The latest tool is the revival of Cultural Revolution-era tip-off measures. He also revealed that investigations into religious belief in villages intensified following the 2019 Spring Festival (Chinese New Year). 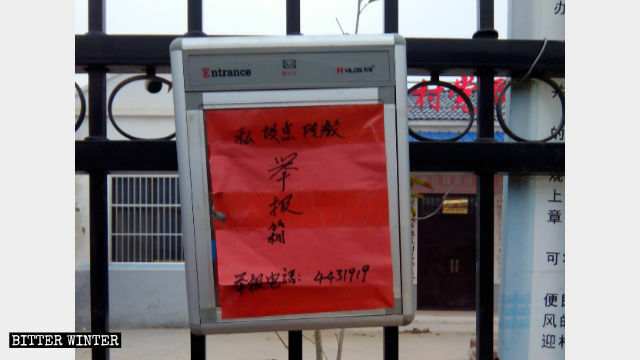 On February 9, a similar iron box was installed at the entrance to the village committee of Chenzhuang village in Mangzhongqiao township. The text on the box reads: “Box for reporting private (meeting) venues and missionary activities,” and gives the phone number for a free tip hotline: 4431919. One local believer said that by setting up “religious belief reporting boxes” and calling on all villagers to monitor and report on their neighbors, the authorities have restricted religious events, gatherings, and evangelism, and have placed believers in danger of being arrested at any time. 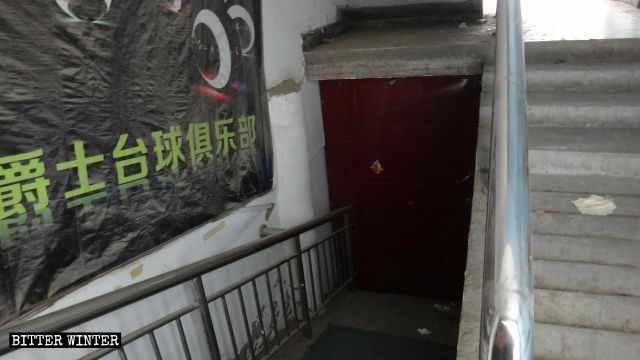 A Three-Self church meeting venue in Zhongmou county’s Dapan village was moved to a relatively concealed basement in a residential building. 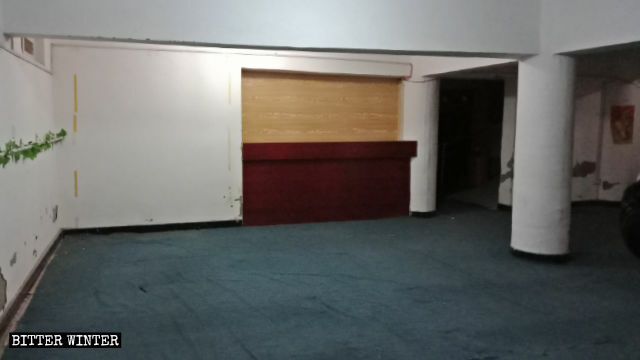 After the meeting venue in Dapan village was reported, the venue’s furnishings were cleared out. 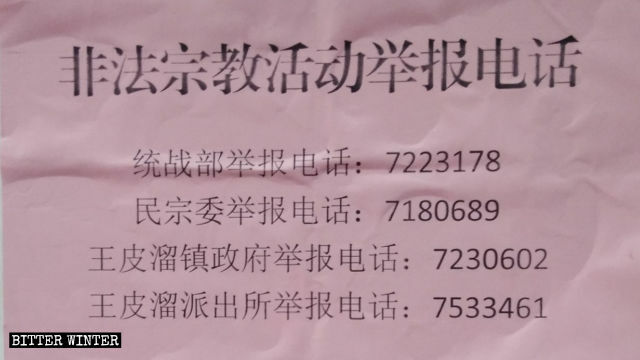 A villager in Wangpiliu town of Henan’s Zhoukou city showed Bitter Winter a propaganda flyer reading: “Phone numbers for reporting illegal religious activities.” The numbers on the list include the informant hotlines for the United Front Work Department, the Ethnic and Religious Affairs Committee, the town government, and the local police station. Some regions have also developed platforms for reporting on neighbors online (such as the Public Security Bureau’s SMS reporting platform and WeChat public account) or by writing letters. They have also set up a monetary reward system to encourage informants. Bitter Winter has obtained a document issued by a subdistrict in Henan’s Nanyang city in July 2018. The document, which details incentives for reporting believers, was formulated to mobilize social forces to crack down on xie jiao. 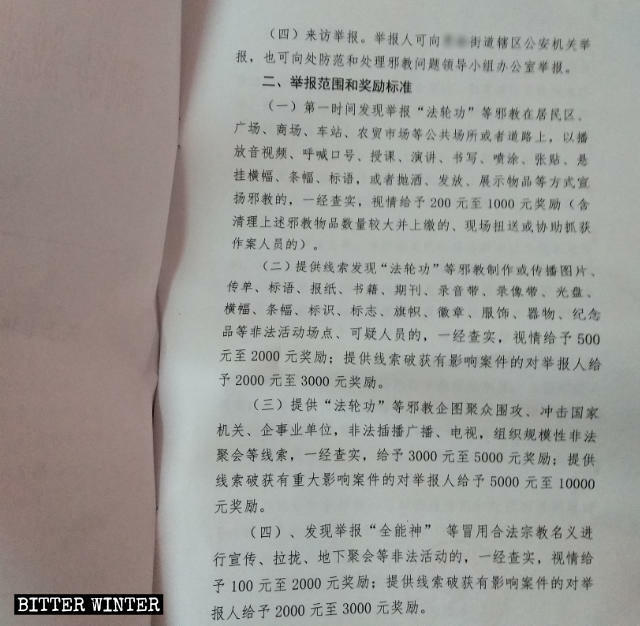 A document issued by a subdistrict in Henan’s Nanyang city, detailing the incentives for reporting believers. 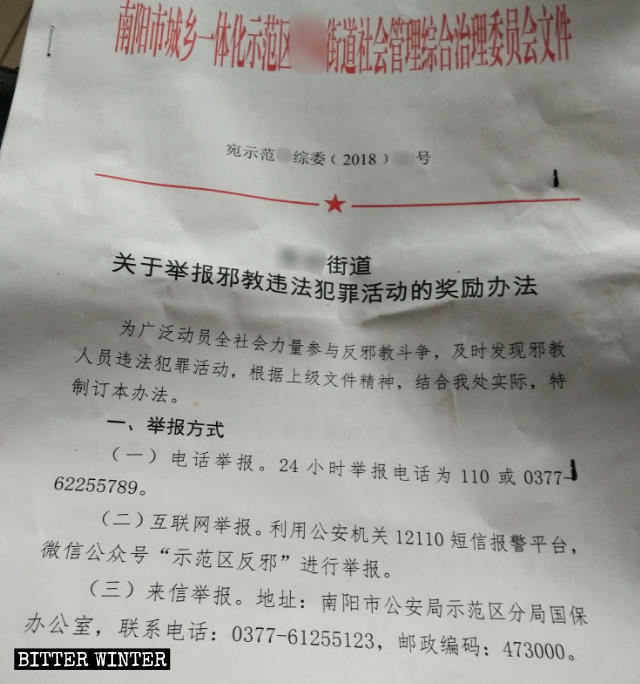 The document states that, upon discovering a Falun Gong member teaching or giving a speech at a public venue, if reported immediately and verified, the informer will receive a reward of 200 to 1,000 RMB (about $30 to $150). Reporting someone for making or spreading images, the informer will receive a reward of 500 to 2,000 RMB ($75 to $300). If the reported tip has a significant impact, 5,000 to 10,000 RMB ($750 to $1,500) will be given. Reporting a believer from The Church of Almighty God will earn 100 to 2,000 RMB ($15 to $300), with the largest reward being 3,000 RMB (about $450). One local retired Party member disagrees with such incentives. He said that the CCP excels at mobilizing the masses to fight against each other, as this was a common practice during the Cultural Revolution, the Tiananmen Square Protests, and the present suppression of religion. But, he fears, it makes it easy for people to develop hatred for each other and increases the risk of believers being arrested and imprisoned. During the Cultural Revolution, the practice of people informing on each other was prevalent in China. 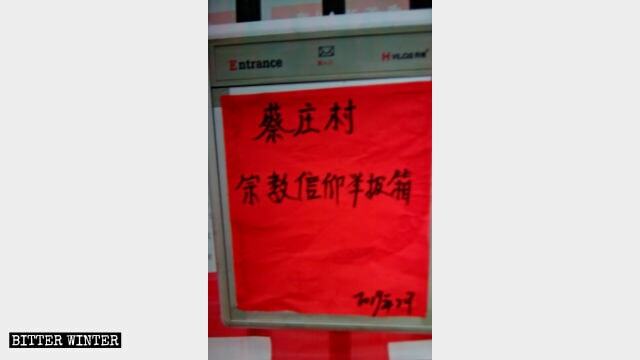 The CCP set up “reporting boxes” and rewarded people who reported or exposed others. The practice has returned, and it is being used to suppress religion.